A field experiment was conducted in the long-term trial on treated distillery treated spentwash application established since 2003 at the Main Agricultural Research Station, UAS, Dharwad. 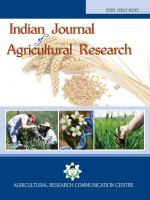 The study was carried out during kharif 2012 to know the response of maize to long-term biomethanated treated spentwash application under Vertisols of Northern transition zone of Karnataka. Experiment consisted of seven treatments and 3 replications. Results revealed that application of 1½ recommended nitrogen through treated spentwash was superior with respect to the growth parameters like plant height, chlorophyll content and dry matter production and yield parameters like cob length, cob circumference, cob weight, number of rows per cob, number of seeds per row, number of seeds per cob and test weight. Both growth and yield parameters complemented each other in realising higher grain and stover yield. Treated spentwash application had also increased the nutrient uptake of the maize. Maize Yield, Nutrient Uptake, Treated Spentwash.